El antitanques americano de mayor producción con 6706 vehículos en dos modelos básicos, manufacturado entre septiembre de 1942 y enero de 1944. Más de un tercio de los Wolverines se suministraron a los Aliados bajo la figura de Préstamo y Arriendo. In contrast to the T49 on the other US TD branch, the M10 gives up speed and camo for better accuracy and armor. While most of the tanks on this TD line do not have turrets, the M10 and Jackson after it do get this nice advantage even though the turret does not turn very fast. The tank's size is too great to remain camouflaged well, although the rotating turret allows you to keep the hull still so that Camouflage Nets and Binocular Telescopes don't reset. Always remember that despite the turret, this TD cannot be played as a medium tank as it is wholly inadequate for that role. Good choice of guns with the fast firing 76mm M1A2 or the powerful 105 mm AT M4 howitzer. While you may be fooled into thinking this large, turreted TD can act as a medium tank, this will almost always end in disaster. Sniping is still the best role for this TD. While not terrible, the camo on the M10 cannot be relied upon as much as other tier 5 TDs and so taking advantage of the great gun depression, turret and mantlet armor to fire from hulldown positions as much as possible is advised. The acceleration is quite poor, and the M10 will often have trouble moving faster than mid-20s despite the high speed limit. The M10 has good accuracy and very high DPM with the 76mm guns, allowing it quickly tear apart anything in its sights. The howitzer can be used, but is generally not recommended as the 76mm M1A2 is so much better overall. The frontal armor is hardly invincible, but allows it to act as a bully against lower tier tanks and at long range many enemy shots at the front may hit the well sloped and heavily armored lower glacis instead. The front is also thick enough to generally withstand penetrations from HE shells, unlike the T49 which will often get one-shotted by HE howitzer shells. It is essential that you never, ever angle the armor on the M10 though. The sides are very thin and will get overmatched by any 75mm or larger gun. The 2nd turret may seem pointless, but it increases the RoF on the guns and HP and so should be mounted despite the higher weight. Overall the M10 plays like a heavier T49. While not nearly as fast or stealthy, the M10 has a slightly better gun and has its own set of tricks to survive some situations where the T49 could not. Just remember that while you do have some armor, it is your last defense and not getting shot in the first place is always preferable. The 76 mm AT Gun M1A1 and SCR 506 radio carry over from the T40. Next research the GMC 6046 engine. Research the 76 mm AT Gun M1A2 for a little more accuracy and RoF. Research the upgraded turret last. The M10 tank destroyer, formally 3-inch Gun Motor Carriage, M10 was a United States tank destroyer of World War II based on the chassis of the M4 Sherman tank. It was numerically the most important U.S. tank destroyer of World War II and combined a reasonably potent anti-tank weapon with a turreted platform (unlike the previous M3 GMC, whose gun was capable of only limited traverse). Despite the introduction of more-powerful types as replacements, it remained in service until the end of the war. Some of those replacements were in fact modified and/or rebuilt from the M10 itself. It was christened the Wolverine by the British, although unlike other vehicle names such as the M4 Sherman, the name was not adopted by American soldiers, who called it TD (a nickname for any tank destroyer in general) beyond its formal designation. US combined-arms doctrine on the eve of World War II held that tanks should be designed to fulfill the infantry support and exploitation roles. The anti-tank warfare mission was assigned to a new branch, the tank destroyer force. Tank destroyer units were meant to counter German blitzkrieg tactics. Tank destroyer units were to be held as a reserve at the Corps or Army level, and were to move quickly to the site of any enemy tank breakthrough, maneuvering aggressively to destroy enemy tanks. This led to a requirement for very fast, well-armed vehicles. Though equipped with turrets (unlike most tank destroyers of the day), the typical American design was more heavily gunned, but more lightly armored, and thus more manoeuvrable, than a contemporary tank. The idea was to use speed and agility as a defense, rather than thick armor, to bring a powerful self-propelled gun into action against enemy tanks. The 3-inch Gun Motor Carriage T35 was the prototype of the M10. It was equipped with a 3-inch (76.2 mm) gun in a new sloped, circular, open-topped turret, developed from the Heavy Tank T1/M6 turret, and mounted on an early-production Medium Tank M4A1 hull. This prototype was further developed by sloping the hull, using an M4A2 chassis, and replacing the circular turret with apentagonal version; this model was designated 3-inch Gun Motor Carriage T35E1. In June 1942 the T35E1 was finalized as the 3-inch Gun Motor Carriage M10 and ordered into full production. Towards the end of production the 76 mm gun M1 was installed in the last 300 or so M10's, as it was being fitted into the new production M4 Sherman tank at the time. The 76 mm M1 offered slightly better anti-armour performance than the previous 3" gun M7. A British variant, designated "17pdr SP Achilles", was developed by mounting the successful 17-pounder anti-tank gun in a modified turret. The 17-pounder was of a similar bore, but had far superior armor penetration capability. It was used by the British, Canadian and Polish armies in Italy and North-West Europe. After World War II, a batch was acquired by the Republic of China Army as demilitarized surplus items. The vehicles' main guns were rendered useless prior to delivery and consequently replaced in 1949 with ex-Imperial Japanese Army 150mm infantry howitzers. The M10 used a Medium Tank M4A2 chassis (M10A1s used M4A3 chassis) with an open-topped turret mounting a 3" gun M7. This gun fired the Armor Piercing M79 shot that could penetrate 3 inches of armor at 1,000 yards at 30 degrees from vertical. Other ammunition carried throughout its service life included the Armor Piercing Capped Ballistic Cap (APCBC)M62 projectile, High Velocity Armor Piercing (HVAP) M93 shot, and Armor Piercing High Explosive (APHE); 54 rounds of 3-inch ammunition were carried. The rear of the turret carried two large counterweights which gave it a distinctive shape. The main shortcoming of the M-10'x 3 inch cannon was its APHE round, which was the round most commonly used for engaging tanks. The 3 inch APHE round was based on the naval 3 inch round and had a small charge in the rear of the round which was supposed to explode after penetration of the targeted tank's armor plating. Unfortunately it was discovered that it exploded on impact or shortly thereafter, causing the round not to penetrate. It is still a puzzling mystery as to why this problem was never addressed with a better base fuse or by deleting the small HE charge in the rear of the round. This was also the problem with the towed version of the 3 inch cannon, the M-5, in the antitank role. A .50-caliber Browning M2HB machine gun could be mounted on the top rear of the turret for use against enemy infantry and for anti-aircraft use, along with 1000 rounds. The crew were also equipped with their personal weapons for self-protection. In its combat debut in Tunisia in 1943 during the North African campaign, the M10 was successful as its M7 3-inch gun could destroy most German tanks then in service. 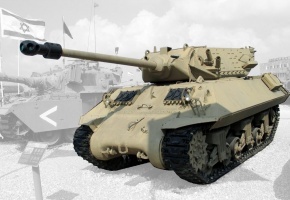 The M10's heavy chassis did not conform to the tank destroyer doctrine of employing very light high-speed vehicles, and starting in mid-1944 it began to be supplemented by the 76mm Gun Motor Carriage M18 "Hellcat". Later in the Battle of Normandy, the M10's gun proved to be ineffective against the frontal armor of the newer German Tiger and Panther tanks unless firing HVAP rounds, but was effective against lighter tanks such as the Panzer IV medium tank and other lighter vehicles and self propelled guns. By the fall of 1944 the improved 90mm Gun Motor Carriage M36 began to arrive in Europe as well. In the Pacific war, US Army M10s were used for infantry support but were unpopular due to their open-topped turrets, which made them more vulnerable than a fully-enclosed tank to Japanese close-in infantry attacks. Approximately 54 M10s were supplied to the USSR though their use by the Red Army service is largely unrecorded. The M10 also equipped units of the Free French Army; one M10 named Sirocco, part of the Régiment Blindé de Fusiliers Marins composed of French sailors, famously disabled a Panther on the Place de la Concorde during the liberation of Paris. British M10s were designated as (Gun) 3 inch Self Propelled Wolverine (3in SP Wolverine) or "M10 3 in SP" and as with all British self-propelled guns were operated by Royal Artillery units. They saw action in Italy and France, many being upgunned with the more effective 17-pounder gun (as the 17pdr SP Achilles) from 1944 onwards. The M10's open-topped turret left the crew vulnerable to artillery and mortar fire as well as infantry close assault, especially in urban combatand wooded areas. By the end of the war its armor was too thin to provide protection from the newer German tanks and anti-tank guns. The other main disadvantage of the M10 was its very slow speed of turret rotation, as the turret traverse was unpowered and the crew had to hand-crank the turret around. It took approximately two minutes to rotate a full 360 degrees. U.S. tank destroyers fired many more high-explosive shells than anti-tank ammunition, indicating that they were employed much like the tanks they were supposed to support. The post-war American film star Audie Murphy earned his Medal of Honor at the Battle of the Colmar Pocket, when he used the heavy machine gun of an abandoned and burning M10 to repel German infantry, despite the vehicle taking several more hits from tanks or artillery. Zaloga, S.J., 2002, M10 and M36 Tank Destroyers 1942–53, New Vanguard Series 57, Osprey Publishing, Oxford, 48p, ISBN:9781841764696. M10 Wolverine aka Achilles Photos & history.